Zarya Boa: Why I love copy/mod - and how I dress! Why I love copy/mod - and how I dress! You know those items you're just never seen without? The ones that you wear all the time, and people see them and just know it's you? For me, that "must have" item is my nerd glasses from HOC. Ever since I bought them they have not been removed. But I like having my nose attachment free - I wear a lot of hats and that's normally where they attach to. There's also my trademark red hair from Gurlywood. Again, something I'm never seen without. I love copy/mod permissions. I can see why people shy away from it when creating thanks to copybots and content thieves but those who have left their creations with these permissions, I thank you. 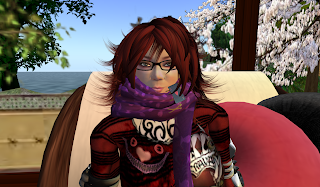 Because of these permissions, I'm able to combine my glasses and hair and free up an attachment point for myself. Yay! It's strange, I'm not a fashionable person in my "real" life. I pretty much wear whatever's clean which does make me wonder sometimes if I was meant to be born a man but that's a story for another day. In SL I am ridiculously obsessed with clothes. I will often spend half an hour each morning trying to figure out what to wear for the rest of the day, and sometimes I won't even stick with it for more than ten minutes. Lots of people in SL are like this, it's hardly a rare thing Zarya? So what's to love about that? Well, perhaps it's a little bit of shameless egotism but I love the way I dress. It saddens me that with all the choices we have available on SL I still see people wandering around with the same outfits on. And that saddens me, we have an entire world of possibilities and everyone sticks to the same things. Not this girl. Although I DO get a lot of my clothes from well known names (Bare Rose and Pixeldolls come to mind) they always tend to be things that people generally relegate to the "costumes" part of their inventory. Things that shouldn't REALLY be worn in day to day Second Life. Screw that, I say. Nothing gets you noticed like dropping into a club dressed as a scorpion, or in full ballerina garb, or even as a shiny knight or a gangster! This is our world and our imaginations. So use them! Looking like everyone else is hardly imaginative now, is it?